Just a thought from 26 December 2006 about For Sale, Photos. I almost didn't make one this year, but I'm afraid that after the last couple years of Bug calendars, he's developed a small following - especially one particularly excellent little boy I know. So if you're a little boy, don't buy it, because you'll be getting one in the mail. For the rest of you, here's a link. This section is called Just a Thought. It's a blog where I post little pieces of what I'm thinking about at the moment. 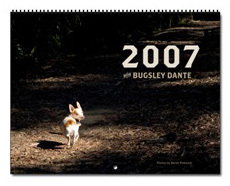 This page is an individual entry called “2007 with Bugsley Dante” that I wrote on 26 December 2006. Before this, I wrote a little something called “Quitting Smoking. Again.” on 10 December 2006.